In a dystopian future, the United States has survived several world wars to become the nation of Illea. Illea is a monarchy ruled by a royal family who reign over several factions. The upper factions are served by the lower factions, and it is very difficult to change stations. Sixteen year old America Singer is from a middle class of artists, and she is madly in love with a boy below her station. Her dreams of marrying her forbidden love are dashed when she is chosen to compete in a pageant for the crown. She, along with thirty four other young women, vie for the heart of the handsome Prince Maxon, but America soon discovers that life at the palace is not as idyllic as it seems. When her former love shows up at the palace as a newly enlisted royal guard, she finds herself torn between her ex-boyfriend and her growing affection for the prince. The dystopian world described by Cass is not particularly believable. It seems unlikely that after several world wars the United States would decide to adopt a monarchy that rules over strict social castes. Perhaps this is especially hard to imagine because capitalism has so thoroughly engulfed American culture. This aside, The Selection was a quick, enjoyable read. The makeover scene reminded me of the movie, Miss Congeniality, and the structure of the selection process was like a hybrid between The Bachelor and Miss America. Given the popularity of these tv shows, The Selection has a built in audience. Cass supplements her plot by throwing in a little political intrigue and a passionate love triangle. These are common themes we see in successful dystopian book series, and are sure to attract teen readers who enjoy books such as The Hunger Games. The sensuality and violence in the book are relatively moderate and it would be a good recommendation for teen readers who fall on the younger end of the age spectrum. Reader’s Annotation: Most girls dream of marrying a prince and living happily ever after, but to America, this possibility is a nightmare. Selected to participate in pageant for the crown, America must choose between the opportunity of a lifetime, and her first love. Kiera Cass is known for her Selection series, which so far comprises of four books and a number of companion novellas. As she mentioned, this series has landed her on the New York Times bestseller list. Compare the selection process to popular pageants and shows like The Bachelor. 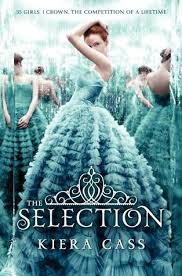 Justification of Selection: This book is a simple and romantic story that is sure to appeal to teen girls. It contains likable character and follows the trend of dystopian novels we see today.